PINELLAS COUNTY, Fla. -- Authorities confirmed an American tourist died in a fiery explosion on a small tour boat in the Bahamas Saturday morning. Nine others were injured. In a press release from the U.S. Coast Guard, official said four Americans were flown to St. Petersburg/Clearwater International Airport. A spokesperson for Bayfront Health in St. Petersburg confirmed they had one patient listed in stable condition. The 48-year-old was brought to the hospital for a fractured ankle. 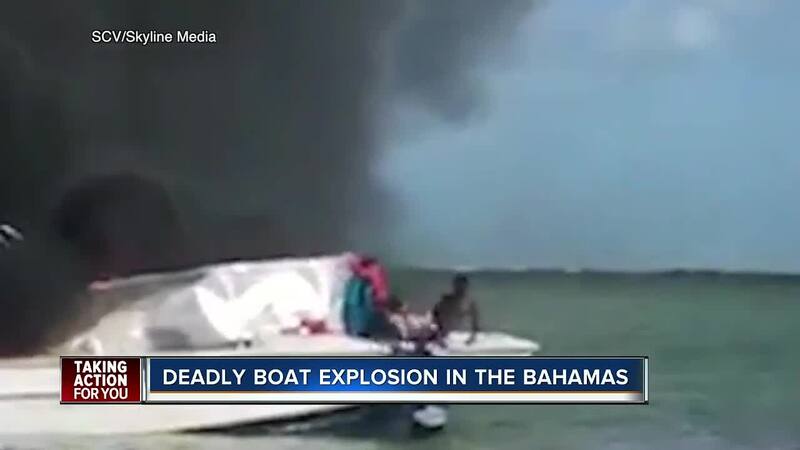 Royal Bahamas Police Force spokesperson Chanta Knowles confirmed to ABC News the explosion happened on a boat carrying 12 people -- 10 Americans and two Bahamians -- shortly after 9 a.m. on Saturday. The cause of the explosion has not been determined at this time. Exuma police are leading the investigation. Video shot by onlookers on a neighboring showed the aftermath of the explosion. Three people on the neighboring boat jumped into the shallow waters and helped to pull at least one injured person off the disabled boat. As of right now, authorities have not given the name of the American victim. In a Facebook post by Exumas and Ragged Island MP Chester Cooper he said two other Americans were listed in "extremely critical condition." Tragically, one of the passengers on the 4C’s Excursion in the Exuma Cays this morning, an American woman, has died as a result of her injuries. Two other people who were on board, both Americans at last report, have been airlifted to Princess Margaret Hospital in Nassau. They are in extremely critical condition. Two more people who were on board, one American, one Bahamian, are being airlifted to Nassau for treatment as of this notice. The remaining six Americans are preparing for airlift to medical facilities in Florida by the U.S. Coast Guard. The remaining people on board do not have serious injuries. My thanks to Minister of Health Dr. Duane Sands for his tireless efforts today. Thanks to the dedicated medical staff in Exuma, too numerous to mention at this point. And thanks to the Ministry of Tourism’s staff for all their efforts in Exuma, Nassau and Florida. This is a sad day for Exuma and a sad day for our American friends. We are saddened and our hearts are hurting, but we will get through this together. Your prayers, as always, are needed and appreciated.